The Rue Anemone, or Windflower, Anemonella thalictroides, is one of the Spring Ephemeral flowers that live in woodlands in Pennsylvania. 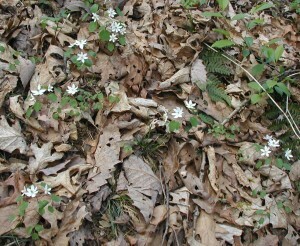 Their bright white flowers are quite noticeable on the forest floor. Rue Anemone flowering on the forest floor. Bright white flowers of rue anemone are stunning against the browns of the oak leaves. Flowers sit at the top of a single stem 6 to 10 inches tall. Six to ten white petals encircle bright yellow-green stamens. The Audubon Guide on Wildflowers tells us that the petals are missing, so the white “petals” are actually sepals. The stamens are numerous. Bright white flowers of rue anemone, the windflower. 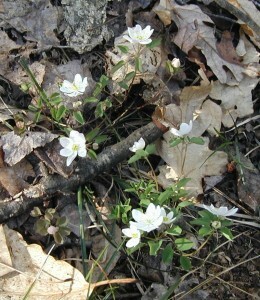 White flowers of rue anemone easily sway in the wind, thus the nickname Windflower. Note in the upper center of the image above that a flower has already lost its petals as the developing seed head is noticeable. Rue anemone has been flowering since at least 5Apr2010, when the above photograph was taken in the woods near Edgar’s Creek. Apparently a common spring ephemeral, rue anemone is found flowering in oak-maple-hickory forests in April in Pennsylvania. This year we’ve seen rue anemone flowering in different areas for the whole month of April, but an individual flower may last little more than a week. Another image of rue anemone flowering in the woods along the Middle Ridge Trail of Little Buffalo State Park, Newport, PA.
Rue anemone flowers and leaves on Middle Ridge Trail. 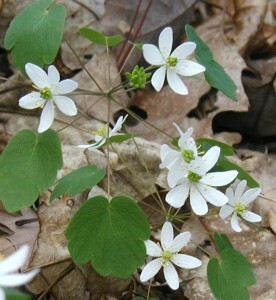 Above are three flowering rue anemone plants on a hillside in the woods. Blooming cohorts include early saxifrage, spring beauty and fairy wings. 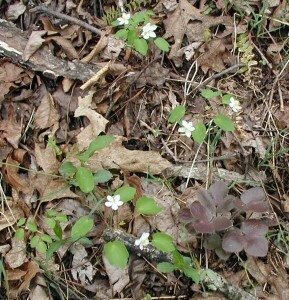 In the image above note the spent flower and the maroon, Round-Leaved Hepatica leaves in the lower right. 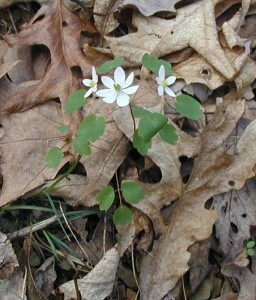 The flowers of rue anemone are held above a whorl of leaves with three or more rounded lobes. Basal leaves on long stalks are compound with three leaflets having three rounded lobes. Basal leaves of rue anemone. In the image above you can see the long-stalked, compound basal leaf with three groups each having three leaflets. There are six larger leaves in the whorl that the flowers emanate from. The flowers and whorled leaves arise from the same point, about an inch or two below the flowers.